The Spiritualization of the world. Why is the spiritualization of the world important? We have seen great strides in technology and the physical sciences are growing at tremendous rates, but spirituality is being left behind. If spirituality is not the main motivator for progress the alternative is greed. Greed works well in a materialistic society where everyone is grabbing for the almighty dollar without thought for their fellow creatures. In fact long term gain is often sacrificed for immediate pleasures. No thought is given for future generations and we leave the world in a mess for our children to clean up. With greed comes anger, fights and wars. As each individual, community and nation struggles to amass more wealth for themselves, they become more and more willing to destroy those who are viewed as getting in the way of their goal. Indeed money becomes their god. In money they trust and when the dollar fails, the whole society falls apart. As manmade systems are imperfect and subject to failure, the dollar will surely fail. We are already seeing economic stress in many parts of the world and it is only a matter of time before it is worldwide. Spiritualization, on the other hand takes a more cooperative stance. Now the individual learns to subject himself to the needs of the society. As we are becoming a global village, that society is ever taking on a larger planetary scale. No longer can our concerns be limited to family, municipality or country. We need to consider the impact our lives are having on the entire planet and beyond. To learn to do this we need to go beyond man's knowledge. No two men can be found that can agree on every subject, so how can all of mankind agree on a worldwide system that will benefit all. In order to do this we need to acquire God's knowledge and subject ourselves to His plan. He created us and He alone can come up with a plan that will benefit the entire human race. How do we spiritualize the world? One may argue that religion has made a bigger mess of the world than materialism. Indeed, religion in the hands of greedy individuals becomes a powerful tool for corruption. Pure religion is very powerful and greedy men recognize this, so they take it and attempt to modify it to their own advantage. Soon religion becomes a bigger cause of strive than non religion. The third teaching of BahÃ¡'u'llÃ¡h is that religion must be the source of fellowship, the cause of unity and the nearness of God to man. If it rouses hatred and strife, it is evident that absence of religion is preferable and an irreligious man better than one who professes it. According to the divine Will and intention religion should be the cause of love and agreement, a bond to unify all mankind, for it is a message of peace and goodwill to man from God. The first thing we need to do to enable the spiritualization of the world is to abandon any idea of the multiplicity of God. God is a loving caring God who wants what is best for us, His children. He has always taught His unity and condemned any idea of multiple gods. To worship any God other than the One True God is idol Worship. To put your trust in any object it to trust in idols. When we worship God alone and put our complete trust in Him, we will not fail. He will show us the way that we may all live in harmony, each one of us as concerned about all others as we are of ourselves. In order to spiritualize the world we need to have classes that embrace all Faiths and all people. A meeting of minds where differences are set aside and our common goals and needs are embraced. Where do we find such classes? Although there may be many such classes in the future there is one organization now that is developing a curriculum for spiritualizing mankind. They are The Ruhi Institute and you can find their web site at http://www.ruhi.org/. They have developed a unique system were tutors lead a study circle through a series of books that they have published. A tutor leads the group but does not teach. All learn together. Although based on the teachings of the Baha'i Faith, Ruhi study circles are open to all and, increasingly, members of all faiths are attending such study circles all over the world. The study circles are offered for free and the books are available at a minimal cost. For those who can't afford it, the books may be subsidized or provided free by other individuals or organizations. 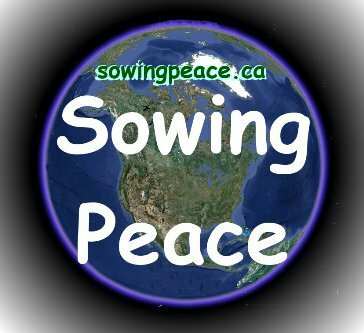 If you are in London, Ontario, Canada, you can email myself at ruhi@sowingpeace.ca. Here and elsewhere you can also contact the local Baha'i Community where you live. You may also contact the Ruhi Institute directly. I am just an interested individual and my views may not be the official view of the Baha'i Community or the Ruhi Institute. I can let you know of some upcoming classes and/or refer you to someone that is starting a class. I feel the spiritualization of the world is of the utmost importance. I am an advocate for peace and I believe world peace will only be achieved through the spiritualization of humanity. Some may come up with temporary fixes, but any system devised by man will fail. Only by turning to the Creator can we remedy the problems that plague mankind. Yes, when all else fails we need to consult the owner's manual supplied by the manufacturer. XXV. It is evident that every age in which a Manifestation of God hath lived is divinely ordained, and may, in a sense, be characterized as God's appointed Day. This Day, however, is unique, and is to be distinguished from those that have preceded it. The designation "Seal of the Prophets" fully revealeth its high station. The Prophetic Cycle hath, verily, ended. The Eternal Truth is now come. He hath lifted up the Ensign of Power, and is now shedding upon the world the unclouded splendor of His Revelation. In the past, prophets have foretold the coming of a great and glorious age; a day when God would rule the earth. This is the day when God's will is done on Earth as it is in Heaven as promised in the Lord's Prayer. This is the day of the fulfillment of prophesy, and therefore prophesy is no longer necessary. Thus Mohammad, the Seal of the Prophets, was the last Manifestation of God to prophesy the coming of the Eternal Truth because Baha'u'llah, The Spirit of Truth who will lead us to all truth, has come. There is only one God, so therefore there is only one religion of God. That religion has been called by different names during different eras, much like we designate special names for various days, although the same sun rises each day. When we are in a forest, all we see is trees. We need to view the forest from a distance to see a forest. We are now living in this glorious age, but is will take historians looking back on it to get a glimmer of its significance. The revelation of God is transforming the World and the evidence of that will be realized in the future. When a mother gives birth, there is pain and turmoil, but when the baby is placed in her arms it is all forgotten. LXI. The world is in travail, and its agitation waxeth day by day. Its face is turned towards waywardness and unbelief. Such shall be its plight, that to disclose it now would not be meet and seemly. Its perversity will long continue. And when the appointed hour is come, there shall suddenly appear that which shall cause the limbs of mankind to quake. Then, and only then, will the Divine Standard be unfurled, and the Nightingale of Paradise warble its melody. Soon a new world will be born, but the new and old cannot coexist, so the old world order will die. We see evidence now as we watch the decay of the political system. At one time a King ruled and none dared to question his authority. Now the political leaders are questioned and doubted at every turn. The element of trust was at one time taken for granted, now trust is at its lowest level. 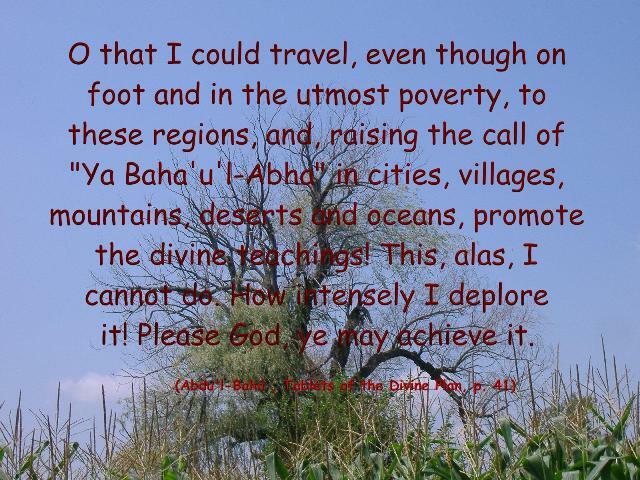 Bahá'u'lláh teaches us that we must be obedient to those in authority. Without respect and obedience the political system will degrade to a state of anarchy. For 6,000 years man has tried to do things his own way, and there have been wars and rumors of war. Each person has an opinion and a belief and each is willing to kill to eliminate those who disagree. Peace by force has not worked. The war to end all wars only led to more war. It is time to try God's way. It is time to try peace. I would love to hear your opinion. Please leave a comment.